Christos Kritikos was born in lamia in 1978. He entered the dental school of Athens in 1998 and he graduated in 2003 with grade ”very good”. After he served his duty in army as dentist in the airborne hospital in Athens and next year he specialized in the field of laser in Germany. During the period of 2005-2008 he specialized in the field of periodontology-implantology in New York University USA. 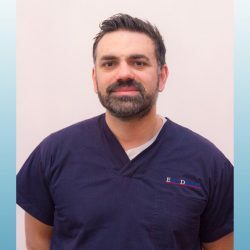 In 2009 he returned in Athens and started his professional carrier in the field of periodontology-implantology and also he continues his participation in several seminars in universities of Germany, Switzerland and USA. From 2009 he is the periodontist in EURODENTICA.